Yeah, I saw the old ticket. AC3 used to work; it was removed recently. So apparently they found out about the timezone check, but if you build it yourself you can still have AC3 support, you just need an iOS dev account. Thankfully this situation will end in 2017 when their patent expires. You can draw your own conclusions. iOS version of VLC 2.4.1 is available today. Good news is channels actually appear natively now, no mor copy/paste. Sadly, the audio does not. A popup displays regarding AC3. I think this is on the VLC side. Previously direct linking to a channel worked with audio. This is what you see on the iOS app when attempting to watch video via the HDHR. Any chance of having a different audio codec to choose from on the HDTC units? Only choice is for HDHomeRun to get Dolby to allow them to add transcoding. Good news! 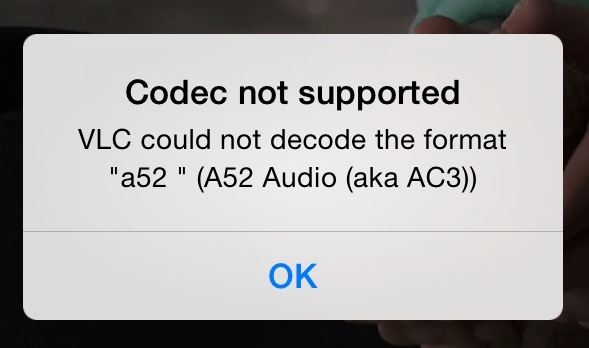 Today's VLC for iOS beta supports audio playback directly from the HDHomeRun. Today's release is 2.6.0b3. I have no idea when that will be generally available on the App Store, but it's certainly encouraging. Bah! The latest beta removes AC3 audio. Let sigh. Note that VLC for Mobile for iOS version 2.7.7 (May 11, 2016) now supports AC3 once again. I can finally watch - and hear - my HDHR4-2US on my iPad and iPhone for free! There's just one problem I'm running into. If I navigate using Local Network, I can see "HDHomeRun DMS 1042ED2C" and select it, and I can see the folders for Favorites and Channels. But if I try to select any channel, it acts like it's about to play, but never does. The first time it threw up an error and referred to the log, but a Web search indicated that you cannot view the log on the iOS version of VLC. So I have no idea what the problem is. Tap Network Stream (not Local Network). If you press and hold your finger on a saved network stream, you will get Copy and Rename options. Copy is useful for entering more channels without having to retype the entire URL. If anyone knows how to solve the direct access problem, please post because I sure don't want to have to enter all 47 channels that my unit receives. I suspect this might be a bug in VLC but I don't know enough to be sure. Or is it possible to ask the request to be denied if all tuners are busy ? My goal is to avoid stopping live recordings when someone starts VLC. Right now it seems that the request always succeeds even if all tuners are busy, so it does stop live recordings. The request will be rejected if the tuner requested is locked, or if auto is used, if all tuners are locked. A tuner is automatically locked if tuning is done via HTTP (including the HDHomeRun DVR and DLNA), DRI (WMC/OpenDCT with HDHomeRun PRIME), the BDA driver (WMC, NextPVR, SageTV, etc. with devices other than HDHomeRun PRIME), and the WMP plugin. Applications that use libhdhomerun or the hdhomerun_config command line to control the HDHomeRun must explicitly lock the tuner in order to prevent other programs from taking it. i've successfully implemented https://github.com/demonrik/HDHR-DVRUI, and i've forked it to play recordings on my minimac/hdtv, via the http://10.0.1.224:34597/recorded/play?id=ff90e6f4 links, but playing the recorded files directly in VLC is a much better experience than streaming...my record engine's storage is nfs-mounted, easily accessible...but it would b nice to map recIDs to filenames...is there any hdhr 'fu 4 that? and streaming liveTV via http://10.0.1.224:34597/auto/vNNN?Clien ... ssionID=nn works, but skipping back (or fwd after pause) doesn't work very well...any VLC 'fu 4 that? i jsut ran into all tuners locked, had to bounce hdhr_record to free them, dunno how that happened...any ideas? Looks like channels 505, 526, and 600 were all going to the IP address of the DVR. There are big gaps in the logs so I can't tell what requested those channels.